Dogs, Blood, Storms, Spiders arrives as the formal debut album of Red Wine and Sugar, which following 2016’s compilation CD Chattels + The Confidence and Humour of John (reviewed here). Although earlier material was clearly experimental in approach, this album sees a greater reliance on minimalism and abstraction. Likewise with the Discogs ‘style tags’ listing: ‘musique concrète, ‘experimental’, ‘spoken word’ and ‘sound collage’, it provides further confirmation of this perception. With the musical framework being abstract and minimal, it is primarily constructed around pulsing textures, wavering tones and further intertwined with various field recording fragments (with detectable elements including: incidental street noise; a broom sweeping concrete; wood wind-chimes; and environmental elements such as birds, crickets, frogs, rain etc.). Coupled with the sonics are the slightly twisted/ treated spoken vocals, which generate an unnerving effect based on their deadpan delivery. Lyrically it continues the established pattern of addressing and describing a range of personalized anxiety based scenarios and internalized dialogue/ observations (while some sections feels to have been quoted from a psychological therapy type manual). To speak of specific tracks, Entering a Room When Others Area Already Seated sonically engenders a sullen and haunted atmosphere, which is derived from is discrete piano melody and abstract and minimalist strings (cello perhaps?). View of the Room Darkened differs given it commences with a series of sparse organ styled synth stabs (and has a more surreal edge due to the greater twisted sonic treatment of the vocals), before shifting pace with moody minimalist sub-orchestral type phrase. For the final of the five tracks, Wherever You Go, Make it so You Were Barely Ever There is the most sonically active, being based around lots of up-close micro-tonal elements and contact mic’ed recordings, while the backing structure is a dour ‘sci-fi’ synth line and minimalist atonal beat. Whilst noting its heavily experimental preoccupations, the album also contains a dark sonic streak which functions to tie together the overall mood. To also mention its graphic presentation, interestingly it has been designed to include all lyrics thus it results in having more of the appearance of a printed inner-sleeve (and therefore immediately skews any initial expectations). Constituting a different and distinct release, this is also a recommended one. Here is another batch of underground goodness from the ever-reliable Trapdoor Tapes label, with a short overview of each provided below. Purgatory is another solo release from the Trapdoor Tapes head honcho, but upon further investigation it is noted to be a re-issue of a 2015 tape released on Altered States Tapes. 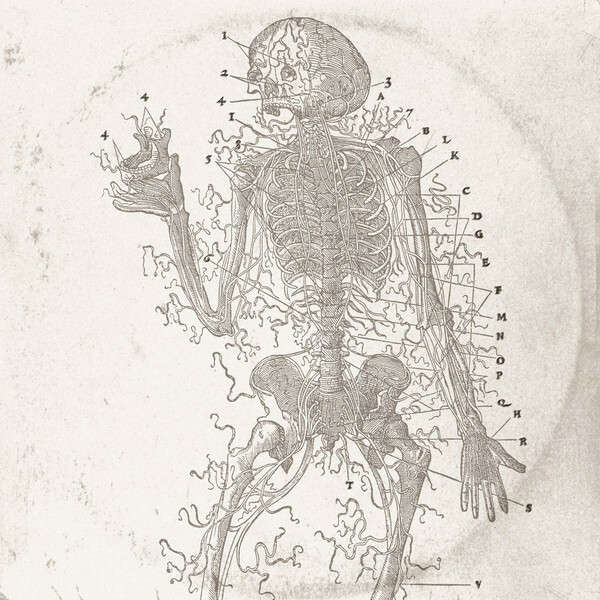 Featuring a single track of around 16 minutes (repeating on both sides), the sound is rough yet muted, minimalist death industrial. Accordingly slow morphing and oscillating textures set a grim and minimalist mood, while the later section is differentiated by a dose of heavy thuds and distorted rumble. Short but effective and certainly to the point. 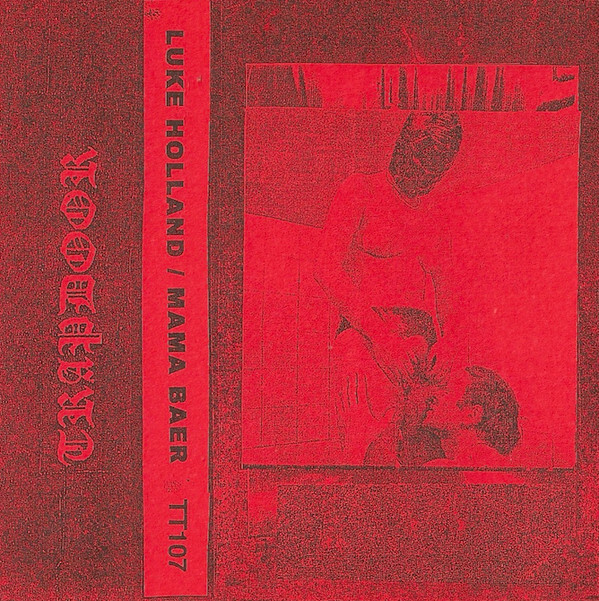 On Luke’s split with Mama Baer, each feature around 20 minutes of material. 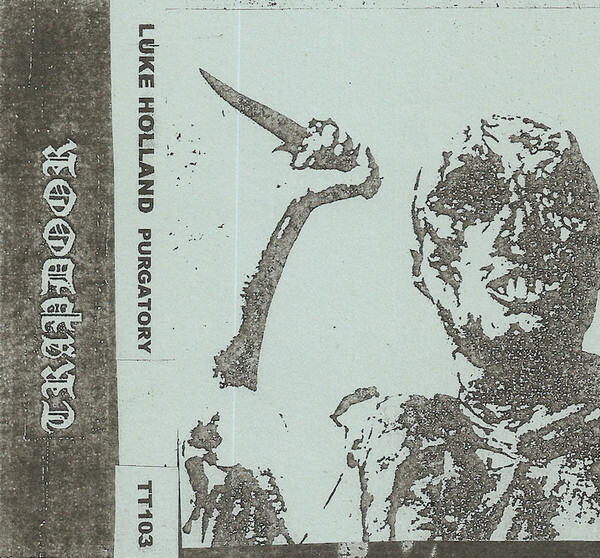 Luke takes the first side with two tracks of his death industrial meets industrial noise crudeness and which effectively bleed into one longer continues piece. While continuing its repetitive and minimalist approach, the sound is quite bit more animated than Purgatory, featuring splitting and grinding loops to hammer home an invasive industrial noise atmosphere. Being absolutely grim in tone, it also ratchets up its squalling intensity with late sonic textures reminiscent of distant wailing fog horns, and overall is more ‘on point’ material from Luke. Having then not come across Mama Baer before, it is the solo project of A. K. I. Hjuler and based on this material this sits more towards an experimental industrial approach. The first track Matecto is a wonky layers soundscape of pulsing sound and swirling textures and processed chats/ vocalisations, while other random sound cut and slash across the track, while on Regina which follows and spans a sweeping dark ambient piece, fused with a heavy dose of spitting static. However, the final track Seaworld is not really to my sonic taste, based on its weird playful mood derived from programmed rhythms and stilted musical elements ( and two out of three is a reasonable strike rate though). Nothinghunger, this is the (death) industrial project of Jael Edwards who is perhaps more recognised from his underground death metal band Ignovomous. However Nothinghunger is then not to be considered a ‘fly by night’ side project given it is reflective of his decades long interest in the post-industrial underground. Commencing with a sample relating to society control the first piece Illuminate quickly establishes a brooding mood of a churning mid paced rhythm, layered sustained drones and associated burrowing tones. The following cut Livestock Management opts for a more minimalist path of muted rumble, wavering drones and occasional dialogue sample, which all sprawls out over extended length. Only For Slaves rounds out the tape, following a similar path by featuring minimalist wonky loops, repeated sample and occasional tonal stabs for good measure. In an overarching sense the approach displayed on of Livestock Management Strategies reminds of the no-frills death industrial sounds being explored on early Sound Source or Old Europa Cafe cassette tape releases from the 1990’s (or even the approach of Puissance as featured on their two early demos before they headed off into far more produced martial industrial and neoclassical realms). 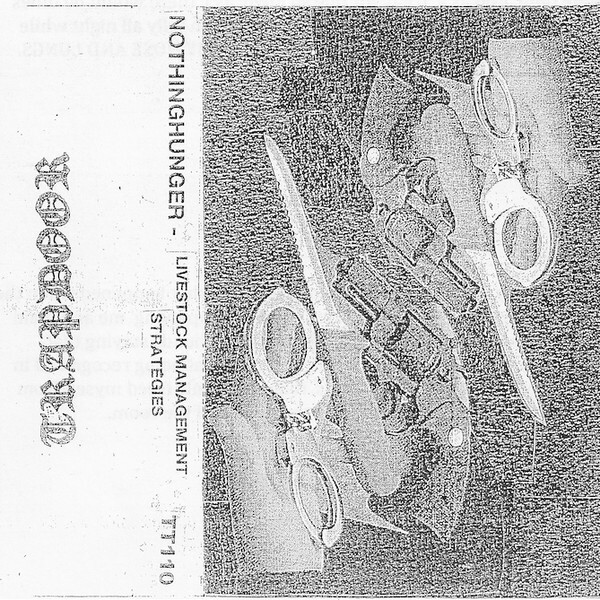 So while Nothinghunger certainly engender a sound rooted in the 1990’s northern European industrial underground (complete with a large number of dialogue samples peppered throughout), the resulting impression is this tape is not purposefully regressive, rather is the simply the resultant sound of Jael’s writing and recording process. Perhaps sitting midway between dark ambient and death industrial mood, this is a decent tape for those yearning for ‘that’ particular sound of yesteryear. Rudolf Eb.er (aka Ruzelstirn & Gurglestock), is someone I have been aware of for a long time, but admittedly have not familiarised myself with his recording output due to the rather imposing back catalogue. This tape now rectifies that and while I get the feeling the sounds on 4444 does not deviate from his established approach, equally I am not certain on this either. Anyway, on 4444 it feature disorientating and minimalist experimental industrial soundscapes, being framed around sustained yet sparse mid-spectrum tones, and static washes which are further augmented with lots of unidentifiable minute ‘up-close’ elements and on occasion a slow ritual like thudding beat. 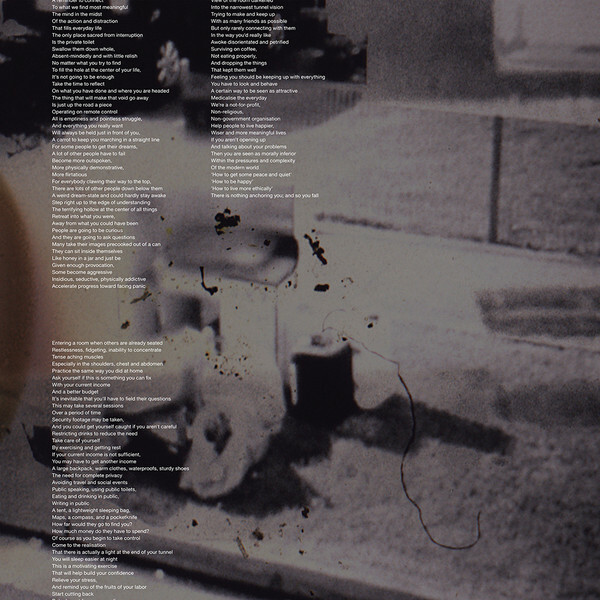 Although four tracks are featured, these play out less as individual pieces, rather the tone is akin to listening to the audio track of an experimental film but without benefit of seeing the visuals, with this impression only being amplified by the fact that over the course of the tape with the sound randomly flicking or cutting between segments. 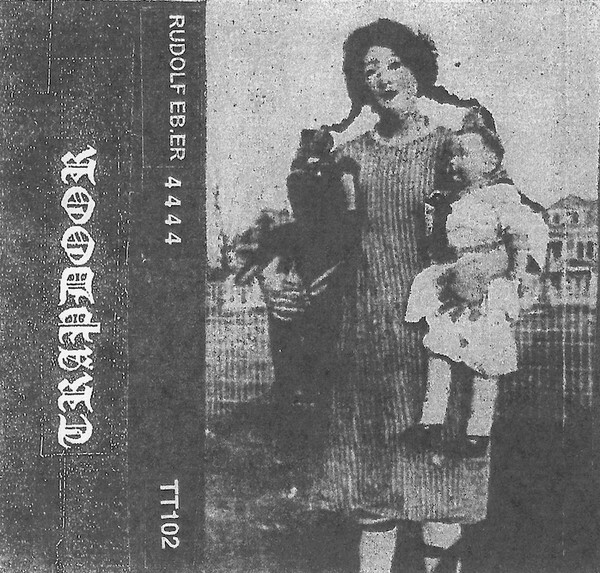 Adding to the surreal edge are various morphed and twisted voices, choking vocal sounds and a multitude of field recordings elements, but also the material never sounds random or improvised, given it has been meticulously constructed (and also executed in line with the agenda of the artist which has been described on Discogs as:“Combining abreactive and cleansing actionism with sonic rituals and psychoactive acoustics, Eb.er generates audio-environments into which he plants grotesque psycho-magic rituals and tantric exercises to trigger a higher awareness”). In essence 4444 has caught me by surprise and is an excellent and particularly rewarding experiencing if fully submitting to its slightly surreal and experimental approach (which is also a slight deviation from the harder and harsher focus of many of Trapdoor Tapes releases). 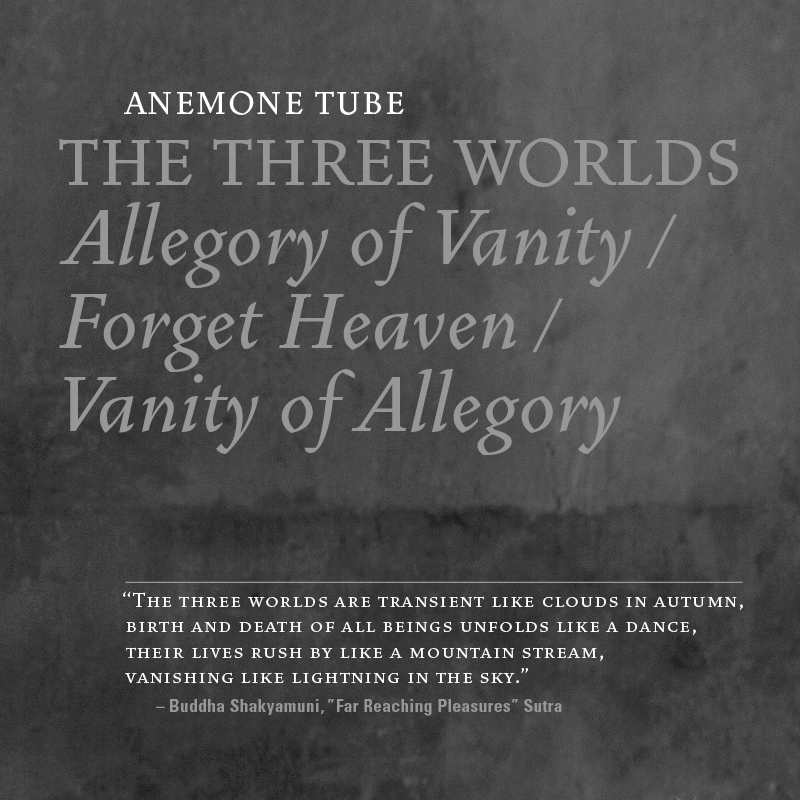 Anemone Tube has been rather prolific in recent years involving main albums and collaborative splits; however, this triple CD does not contain new material, but functions to draw together a collection of earlier out of print and previously unreleased material spanning the years 1997 to 2013. With the tracks on CD1 and CD2 dating broadly from the period of 1997 to 2000, they are notably looser and less refined, but do still retain a semblance of structure and direction, rather than being overtly chaotic. Overall there is a sense of the tracks being sprawling in scope, built around atmospheric yet abrasive sonics and fleeting musical moments which are revealed through synth washes, sampled Asiatic strings, clean-plucked guitar, pulsing programming etc. (depending on the track). An overall impression of this material is that the production sits towards the murkier grey-toned end of the sonic spectrum, which is particularly highlighted when compared to the tonal clarity of current material. Another observation to make is that as the material featured on the first two discs is from the earlier phase of the project, it is perhaps more typically representative of the abstract post-industrial sounds being produced at the time. As such the material on the first two discs is specifically interesting in providing context to the early developmental phase and is equally demonstrative of how far Anemone Tube have progressed with their sound and approach to composition and production on current releases. With the first two discs providing a history lesson on the project, the material featured on the third disc more readily resembles the current sound and direction of Anemone Tube (six tracks are from the 2007 to 2013 period, with a further three from 1998 to 1999, but only released in 2013). The first unreleased piece, Obscure the Sun, is grim and ominous in tone and expertly blends field recording elements, mid-toned distortion and melodious synth lines; it unites nicely with the following three tracks which are previously unreleased pieces from the Death Over China recording sessions. While these pieces are equally complex and as engaging as the material on Death Over China, they are notably different for their distorted ferocity, junk metal crunch and pulsing structures (it’s then understandable why they were not included on the main album). The following four tracks are broadly similar in that they are short tracks which opt for a looser and sprawling, partly attacking, industrial noise approach. This then leaves the final track From Anthropocentrism to Demonocentrism II to conclude the set with a more recognized (and excellent) piece of heavily-treated field recording elements, invasive distortion, and looped melody-tinged drones. On the visual side of things, the beautifully designed packaging, highly conceptual imagery and overall slick and refined presentation functions to unite these various recordings under a coherent banner. Available in two editions, including three separate CDs each in six panel digi-file (300 copies) or as a special edition hand numbered edition in a cardboard sleeve including a poster, sticker, and patch with logo (100 copies). Editor’s postscript note: The above review was prepared based on receiving a pre-release digital promo, thus I did not have the complete artwork and packaging in hand at the time it was written. However, now that I have received the full physical release, I have noted it functions to more clearly separate the work into its three parts, which includes separate covers with individual artwork and liner notes that allows the strength of each disc to shine through. I have also found it necessary to reevaluate my prior comments above regarding the first and second CD’s, particularly as this new found appreciation has revealed far more variation and sonic detailing in the earlier works than the above review might otherwise suggest. So while each disc can certainly stand on their own, it also reinforces the impression of this triple album as a strongly focused conceptual set and is best appreciated in its intended totality. The sound of Last Dominion Lost has always been rooted in an early primitive industrial expression, and particularly within the archetype established by SPK on their first two albums. Yet it must also be said that Last Dominion Lost have never sounded purposefully regressive; rather their sound is reflective both of the age and creative lineage of its members (which itself in part links back to SPK). It is also unavoidable to observe that the death of key member John Murphy in 2015 looms over this album, particularly as it features his contributions made before his untimely passing. Yet even in the face of John’s death, the remaining members of Jon Evans and Julian Percy have regrouped and forged ahead, being joined by the former sessional member Till Bruggeman now as a full-time member. While the previous album hinted at influences from early SPK, this album builds upon that influence within their own sound to deliver what is their most well realized album to date. In its broadest sense, these tracks are shorn of any feeling of being a predetermined ‘song’ format, instead they are showcased as disorientating ‘movements’ which follow their own patterns and internalized logic and elevate atmospherics over any display of overt aggression. As such, sporadic garbled whispers, yells and cries from the asylum mix with treated radio voices, shattering glass, atonal rhythmic elements (generated from a multitude of atypical percussive sources), pulsing/sweeping/brooding synth lines, abstract guitars/bass and generally perplexing tones/sounds. These elements then intermingle in the best way possible by never feeling unduly chaotic, unplanned or improvised; rather the material feels to be the result of the meticulous composition of non-musical elements to create wonky and disorienting industrial soundscapes. This is not a long album by any measure given it features 10 tracks over 40 minutes, but with the tracks being generally in the order of four minutes each, they bleed one into the next as part of a greater whole and from this perspective it is of far less importance to highlight individual tracks. Although, to speak of an individual element, John’s distinctive wailing vocalizations scattered throughout the album are a welcome reminder of his involvement and legacy. Sound-wise the production is clean, loud and tonally separated, which in the listening provides a painstaking level of detailing across its deeper bass-addled elements and upfront micro-tonal textures. With the sheer glut of post-industrial albums being issued over the years, thankfully albums like this come along to clearly establish how things should be done, which is then based on the degree of professionalism applied to the writing, recording and production and which is further reflected in the graphic design and presentation of the sleeve. On all fronts, this is a clear highlight of 2017. Having heard a number of early album’s from TenHornedBeast (around a decade ago now), it seems that I have not kept up with continued output over recent years. From my memory of those earlier releases they encompassed dark ambient drone-scapes, but also verged of doom drone at times through the use of slow distorted guitars (and while I enjoyed them, they also did not stay in listening rotation for long and have not revisited them since). 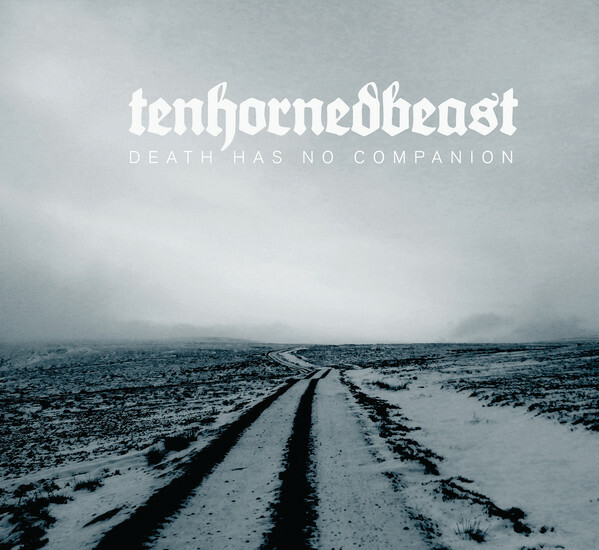 Yet Death Has No Companion has now thrust me back into the sonic world of TenHornedBeast and it has come as rather a bit of a refreshing surprise. To speak of the album’s cover, straight off the mark the sound perfectly matches the atmosphere of the wintry imagery (photos taken by solo member Christopher Walton). This also reveals the core focus of Death Has No Companion as cold arctic drone-scapes, where sparse compositional minimalism give rise to widescreen barren vistas in the mind’s eye. Featuring only three tracks the album still spans 60 minutes, meaning the tracks are on the lengthy side (between 17 and 24 minutes each), thus take their in sonically unfurling. Being constructed around a base of slow morphing drones and sustained shimmering textures, additional elements provide tonal variation (such as sparse horn/ string like melodies, sustained lone piano notes and (perhaps?) treated gong tones). The middle track The Lamentations of Their Women is also the most animated of the three offerings, featuring a prominent cyclic loop, and with some more ‘metallic’ tones layers verges slightly towards a death ambient sound. A general observation to be made is that the sound is rooted in a ‘classic’ 1990’s expression, which is perhaps reflective of Christopher’s long-standing involvement in the underground, extending back to his days in Endvra (and of interest this album being similar in part to the sonic minimalism of Endvra’s album The Watcher). Although elongated, meditative and heavily abstracted, there is still more than ample sonic nuance to be discovered which ensure this an engaging album and which can masterfully draw you into its cold and barren world. Based on this album, it now has me intrigued to investigate back catalogue of album’s which have previously passed me by. 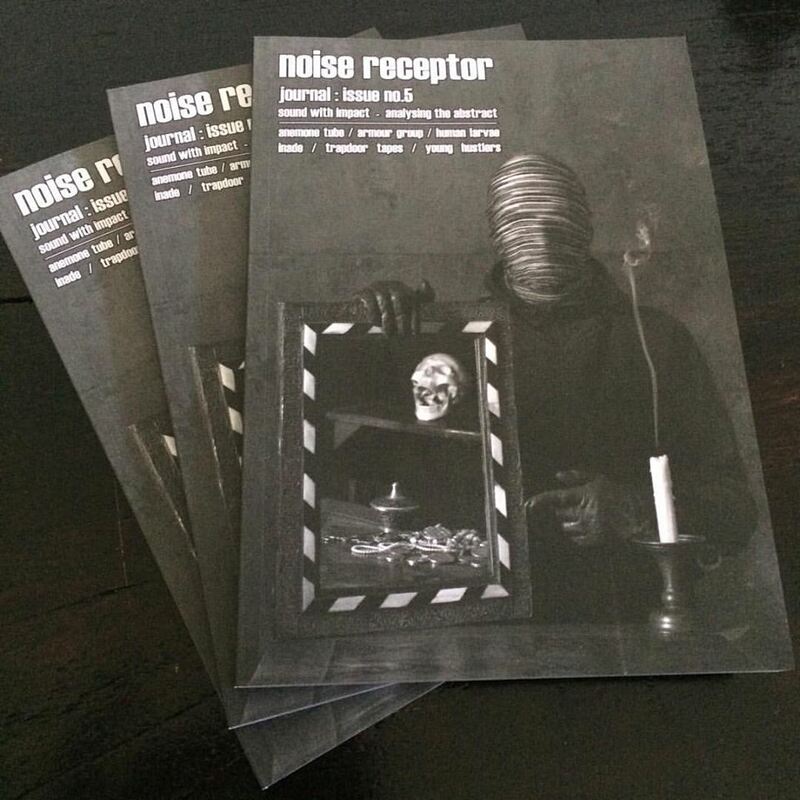 Noise Receptor Journal Issue No.5 released! CONTENT: In depth interviews with: Anemone Tube, Armour Group, Human Larvae, Inade, Trapdoor Tapes Young Hustlers. Tower Transmissions VI live report with photos (8 pages). Two ‘visual essays’ by Anemone Tube, spanning 14 pages. FREE CD: All direct orders will receive a copy of the newly released Cold Spring Records Sampler CD ‘PYRE’, featuring 15 tracks of Industrial, Esoteric, Dark Ambient, Ritual, Japanese Noise, Drone, Power Electronics, Doom, Death Industrial, Experimental. More details here.